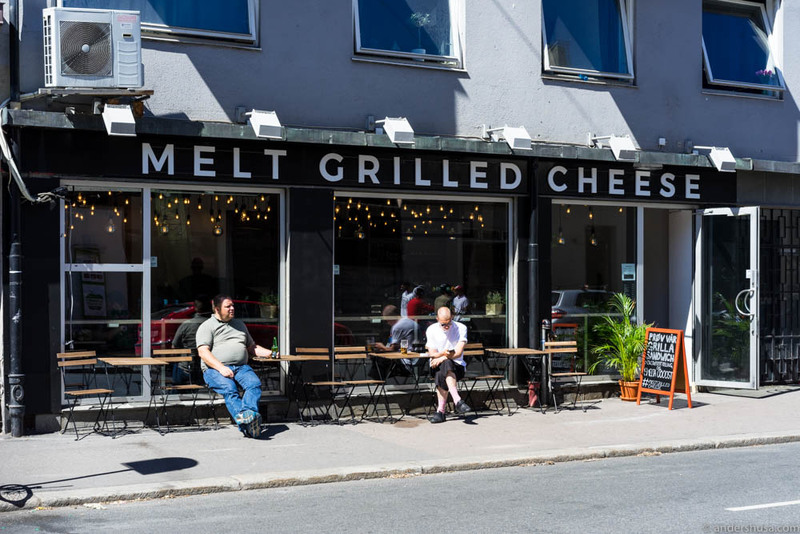 Finally, there’s a restaurant dedicated to toast in Oslo! 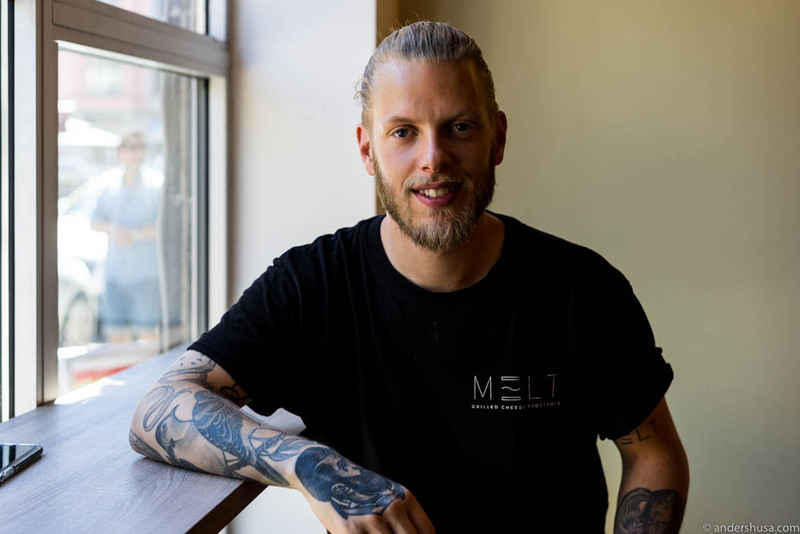 Melt Grilled Cheese originates from Trondheim, where former Michelin chefs Jonas André Nåvik and Kim Asserson first opened a food truck and later a toast bar. When we visited Trondheim (I promise, my guide is coming very soon!) we tasted their toast at the Sirkus Shopping mall. I also paid a visit to the Melt pop-up at Aker Brygge around Christmas time last year. The first proper Oslo location (they have ambitions to open several) is at St. Hanshaugen. The shop is run by Kim, while Jonas is busy back in Trondheim preparing to open his fine dining restaurant Fagn in the old venue of well-known Credo. Asserson used to work at the three-Michelin-starred restaurant Grace in Chicago. Let’s just say he knows a thing or three about cooking. At some point, he decided to go back to basics and focus on making one of the best damn dishes out there – grilled toast. I’ve said it before, but some of the best things in life are the simplest. A good sourdough bread with whipped, salty butter, a creamy burrata with shaved lemon peel and a good olive oil – or just toast. In my opinion, you want the toast served fairly warm (but not scalding) with the cheese properly melted. There are few things I hate more than people who rush when they grill a toast. Imagine, building up all those expectations, only to be served cold, unmelted cheese inside. The bread should be crispy and light. 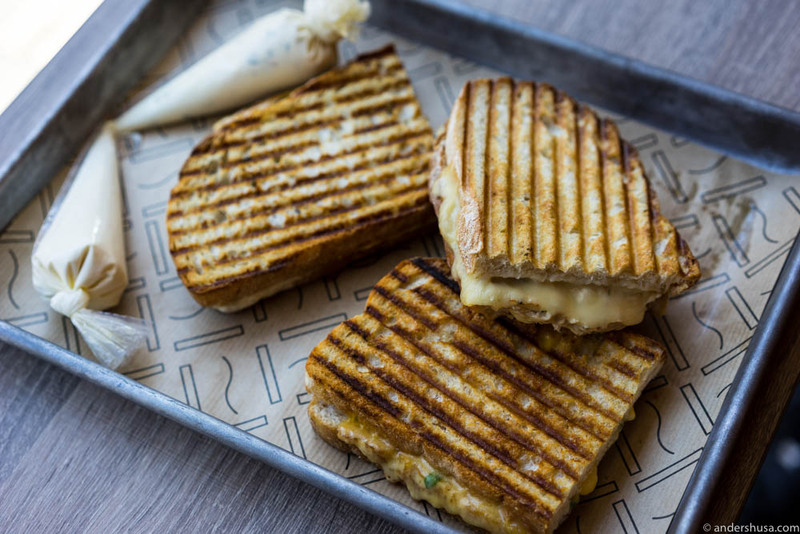 At Melt, they use sourdough bread, which they brush gently with browned butter. The result is impeccable, with a crunch in every bite. I ordered three different grilled sandwiches and asked for half sizes. “Is three of them too much?” I asked Kim. “Sure is for me, but I have confidence in you,” he replied. I paid NOK 223 for three half toasts. Kim was probably right, though, most people could do with just two and get their lunch budget closer to NOK 140-150. In Trondheim, I had tasted Melt with lasagne and Norvegia cheese inside, Italia with fennel salami, mozzarella and parmesan, and Tidlig with egg, bacon, and Jarlsberg. The latter was my favorite, but this day I wanted to try new flavors. I selected the Original with ham, cheddar, and mustard, All Cheese with Norvegia, mozzarella, cheddar, and parmesan, and Club with confit chicken. My new favorite is all cheese … As simple as it gets! Check out my friends Lars Spiser and Camilla’s thoughts on Melt (Norwegian articles). How do you like your toast? Please share in a comment below.